Above: Symphony has two atriums. Each one is dominated by a large installation. 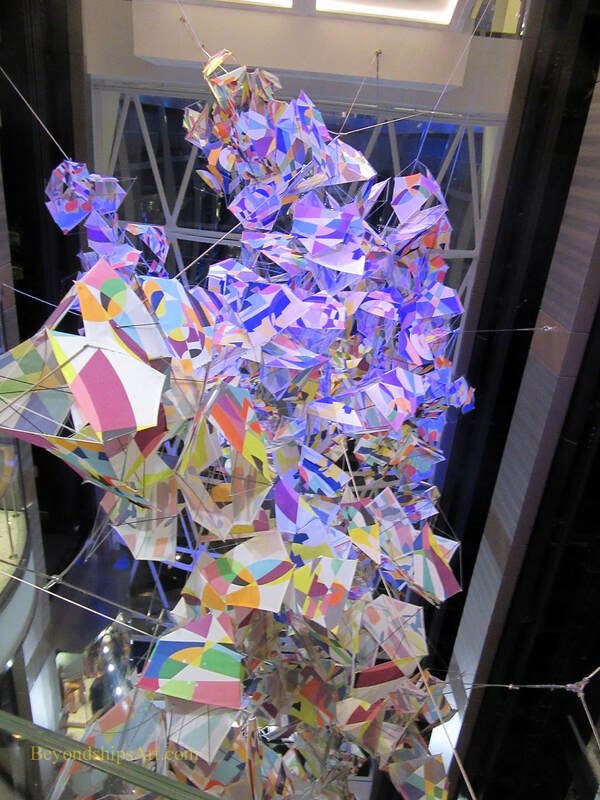 The aft atrium has "Kites" by Marcelo Jacome. 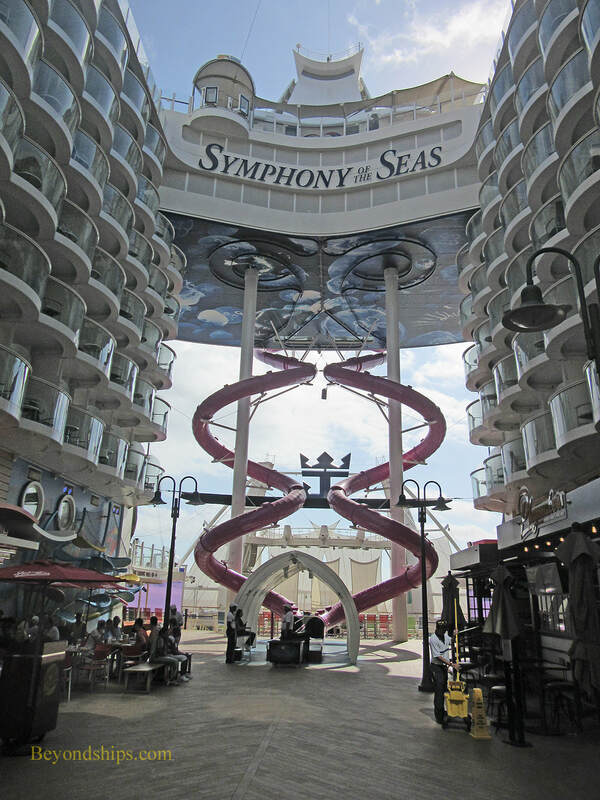 Symphony of the Seas is a very large resort-style cruise ship. Because she is so large, she is able to offer guests numerous options with regard to entertainment, dining and sports facilities. The largest cruise ship in the world when she entered service in 2018, Symphony is an Oasis class ship. 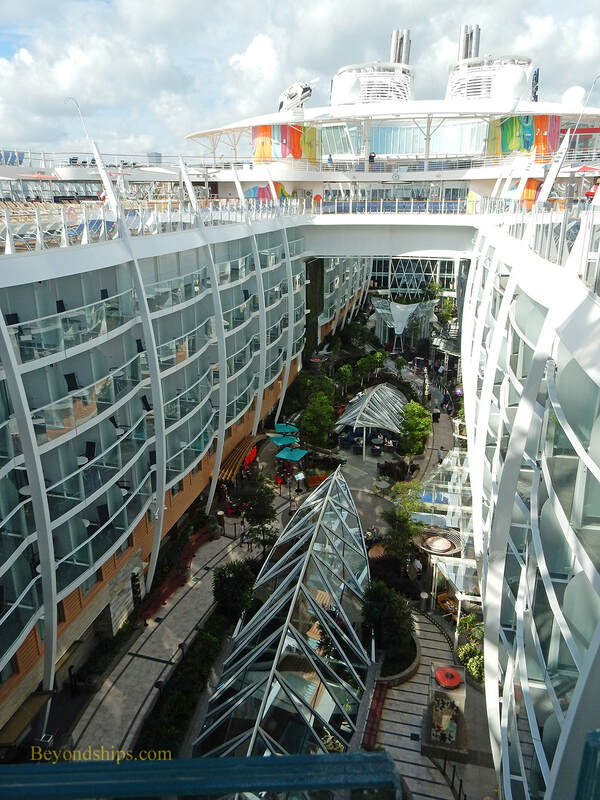 Her sisters include Oasis of the Seas, Allure of the Seas and Harmony of the Seas. 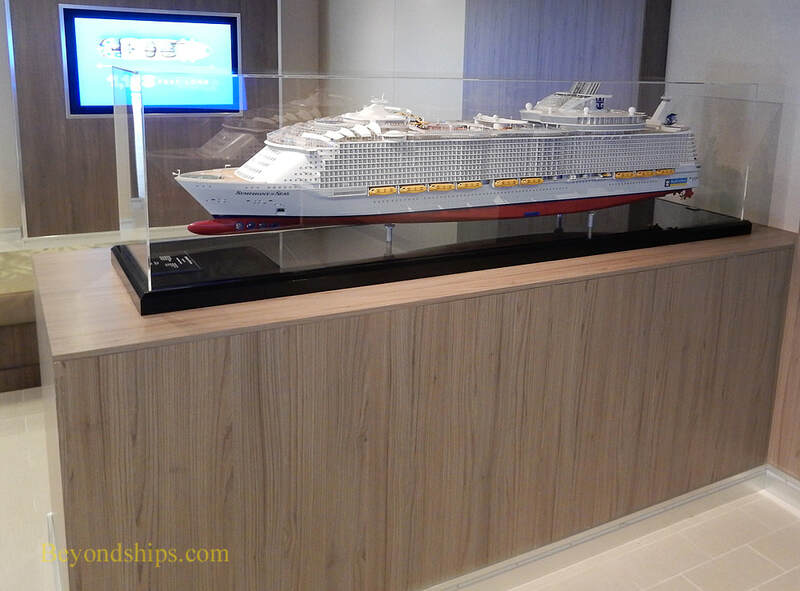 She was the second ship built in the second generation of the Oasis class and is very similar, but not quite identical to, her immediate Predecessor Harmony of the Seas. The size of the ship helps with stability. At the same time, Symphony is remarkably maneuverable for her size. She can also sail at a respectable speed when required to do so. Passengers on Symphony are an international mix, however, a significant majority are usually North Americans. The ship is family-friendly and much of the programming is geared toward young families. Symphony can accommodate a large number of passengers. However, all of the various alternatives offered onboard tends to have the effect of spreading the passengers out. As a result, there is less crowding than on many smaller ships. 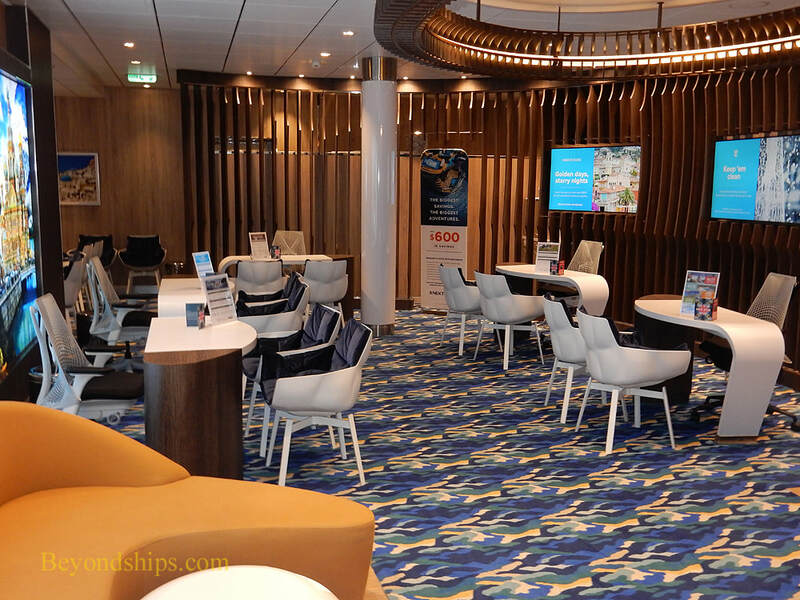 Along the same lines, there are now cruise ships that approach the Oasis class in the number of passengers that can be accommodated. However, since these ships are physically smaller than Symphony and her sisters, it follows mathematically that these other ships have less space per passenger. Above: Gregor Kregar's "Paradox Void" is the centerpiece of the Royal Promenade. Symphony has an extensive collection of contemporary art. (See separate review). As with each of the Oasis class ships, Symphony is divided into seven "neighborhoods." The original reason for using this term was to underscore that these ships are so large that they actually are cities at sea. However, the neighborhoods do serve a practical purpose. They are themed areas. This grouping is intended to let guests seek out the experiences that best suit their style, mood or preferences. However, three of the neighborhoods are not so self-explanatory so we will discuss them below. Symphony continues to have some some of the traditional features of a Royal Caribbean promenade. 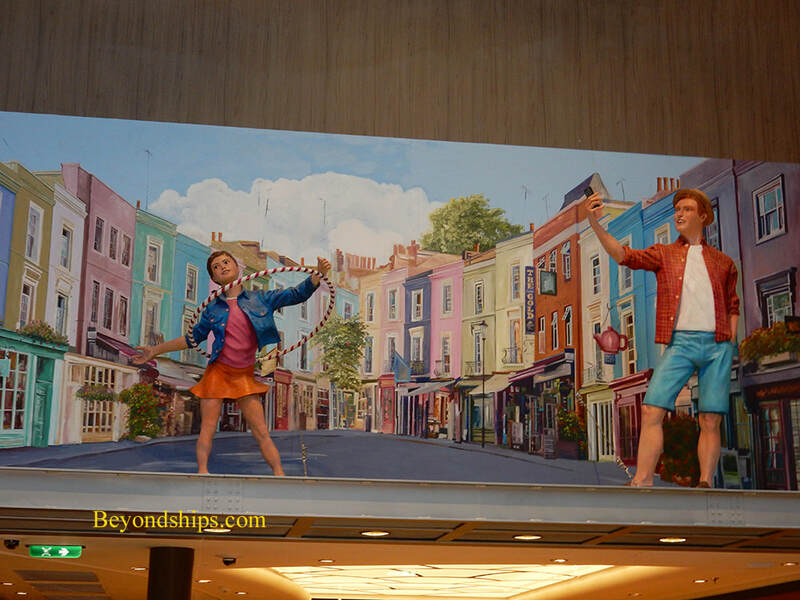 For example, there are life size, painted figures (right). 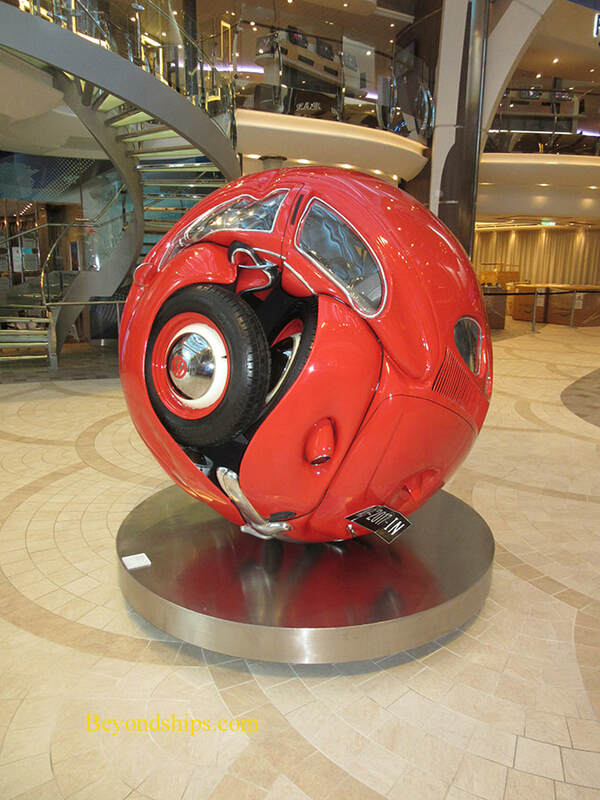 Also, as on past ships, there is a classic car on the Royal Promenade although on Symphony it has been crushed into a ball (above). 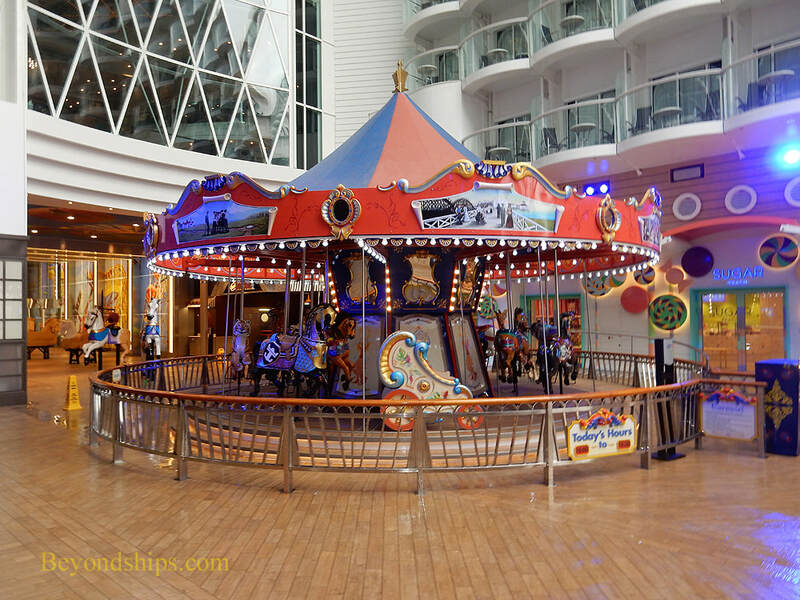 The Royal Promenade is a signature Royal Caribbean feature going back to Voyager of the Seas in 1999. 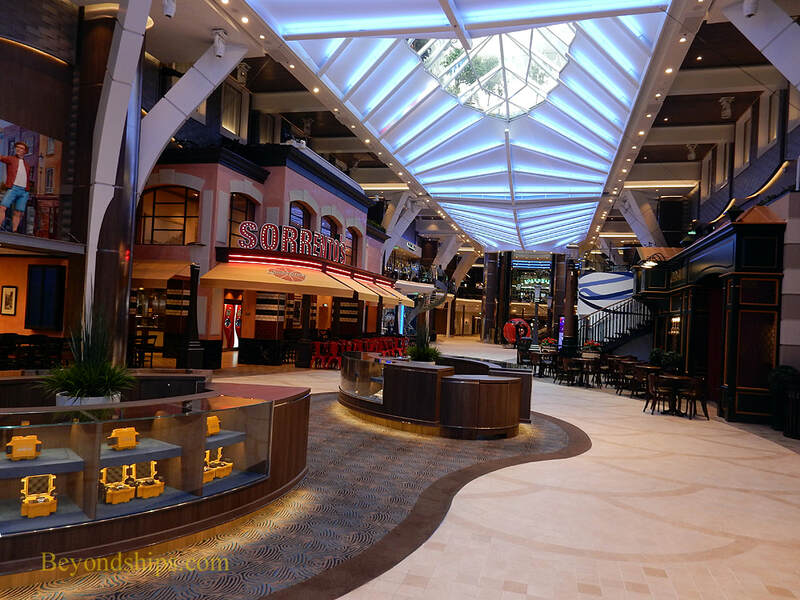 On the earlier ships, this two deck high corridor looked like the main street of a town with shops, restaurants and bars arranged along its sides. 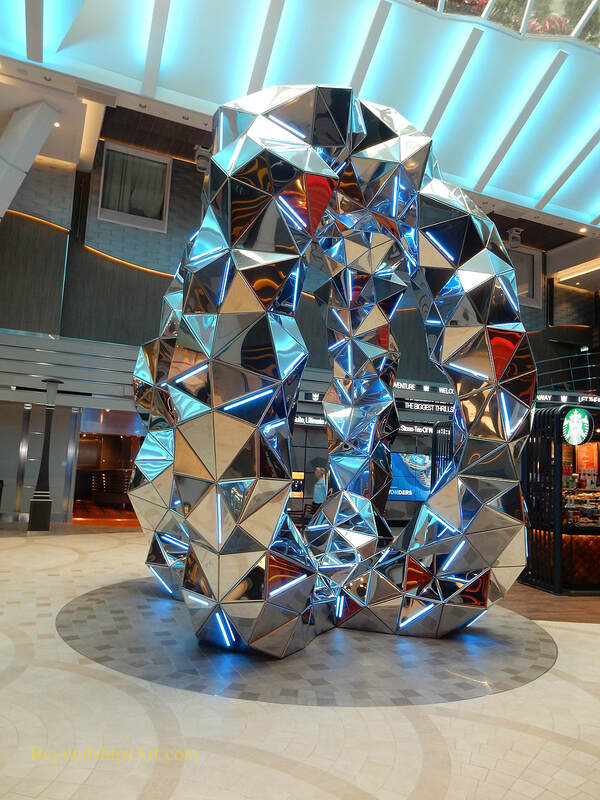 Much wider on the Oasis class ships, it resembles a large enclosed mall. Perhaps because it is the center of the ship, people gravitate to this place. 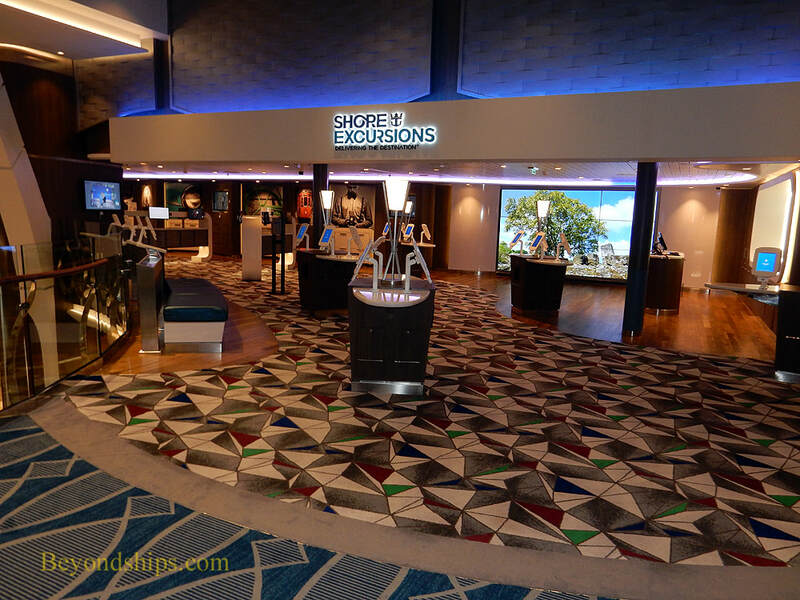 They come to shop, eat, have a drink, be entertained by parades and theme parties, people watch or to transact business at the guest services desk, the shore excursions desk, the future cruise office or the loyalty desk. 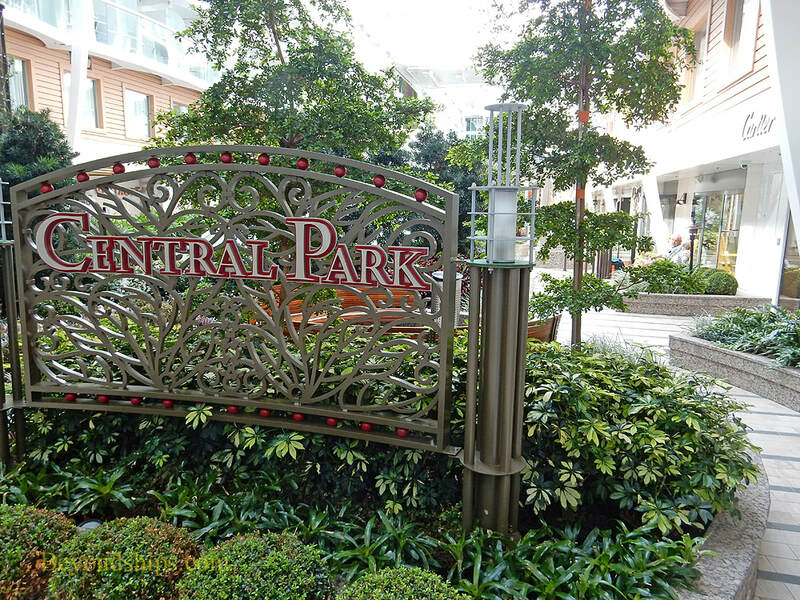 Central Park is immediately above the Royal Promenade. However, whereas the Promenade is enclosed, Central Park is open to the sky. It is populated with hundreds of plants, a green space at sea. In the evenings, it is a beautiful place to come and listen to a classical guitarist with relatively few people around. The Boardwalk is an open air area leading to the stern of the ship. It is inspired by the seaside resorts of the last century. The atmosphere is casual and carnival-like. At one end is a working carousel while at the other end just before the Aquatheater is the Ultimate Abyss slide. Consistent with that atmosphere, the shops and eating venues are not as up market as those of Central Park. 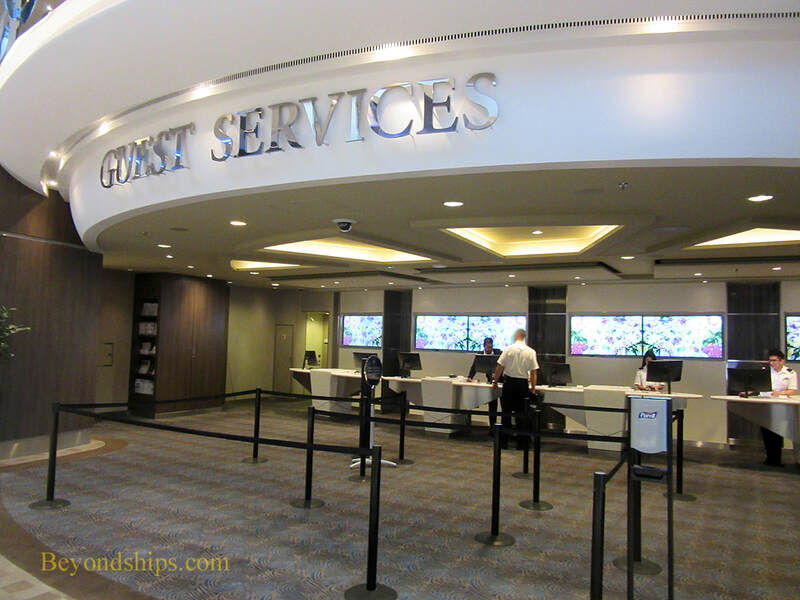 Above left: Guests Services is the reception desk where guests interface with the staff on a wide range of issues ranging from accounts to lost and found. Above right and right: The Shore Excursions office is next to the photo gallery on a mezzanine overlooking the Royal Promenade. There are also shore excursion kiosks on the Royal Promenade. Staff members are available to answer questions at certain hours but guests can buy excursions at any time using the terminals. 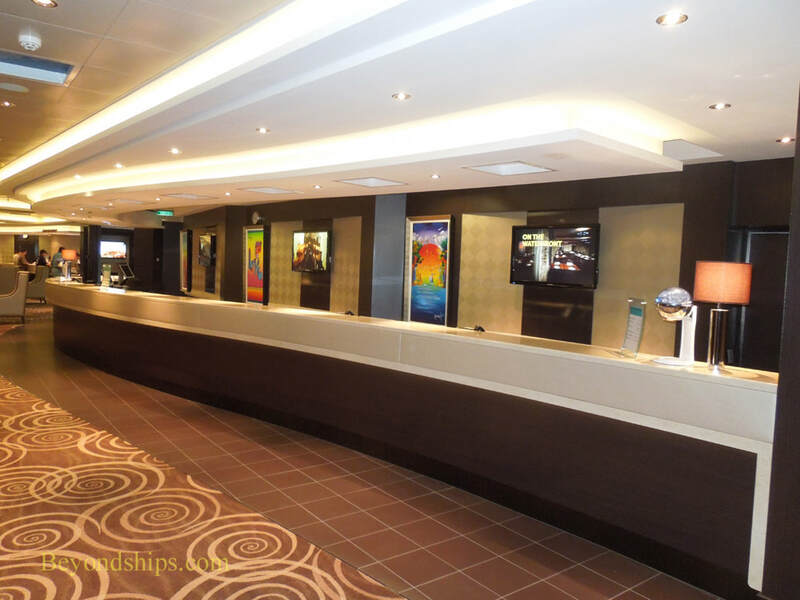 Excursions can also be purchased using the stateroom televisions or by using the Royal IQ app. 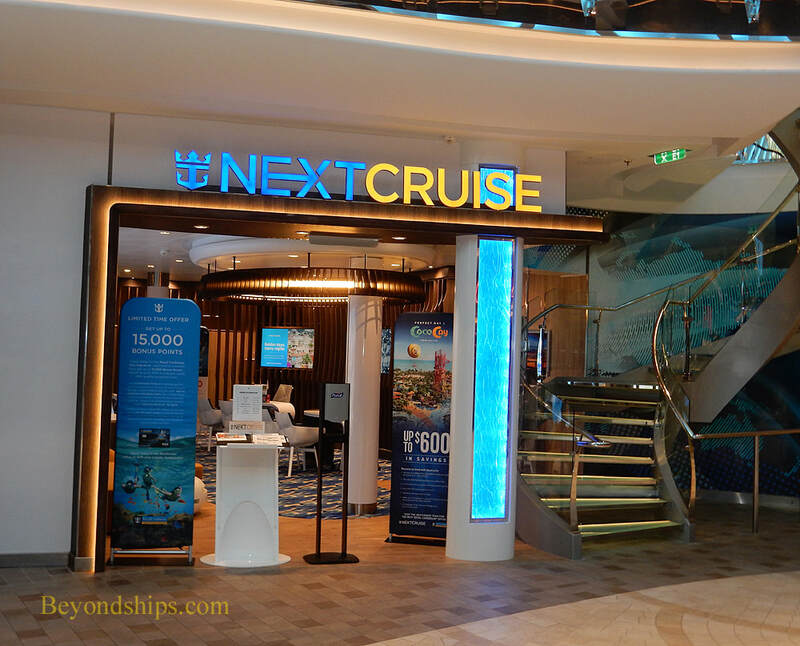 Below: The Next Cruise office sells upcoming cruises on Royal Caribbean and affiliated lines such as Celebrity Cruises and Azamara Club Cruises. It is located on the Royal Promenade.